The No. 59 does one thing. It allows you to drill a perpendicular hole in a piece of wood as wide as 2 3/4 inches. The original intent of course was to set up corresponding holes for doweling.....but the fact is, there is so much more this tool allows you to do! Line holes can be drilled, mortises holes can be set up. 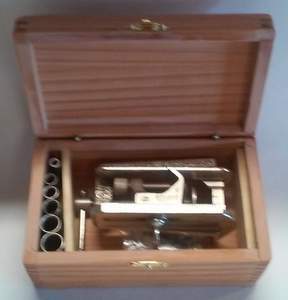 By making a drill block in a thick piece of wood, you can even drill a straight hole on any large piece of wood.....Essentially, the Stanley No. 59 does a lot of things a drill press can do. One of the main problems with vintage No. 59's is the tendency for the drill guide bushing to get lost. Even though these still are available through Stanley Tools, they tend to be a bit pricey. I've been working on making my own sets, and will hopefully be able to offer these in the near future. In the mean time, I do have a number of bushings on hand salvaged from older jigs. The basic No. 59 went through several evolutions throughout its life. The final models were offered just prior to the end of the last Century. Quality-wise, all of these tools are pretty much the same. I have offerings of each evolutions (They were all the same model) and will be picturing them very soon with explanations of each one. Viewers are invited to contact me for information the Stanley No. 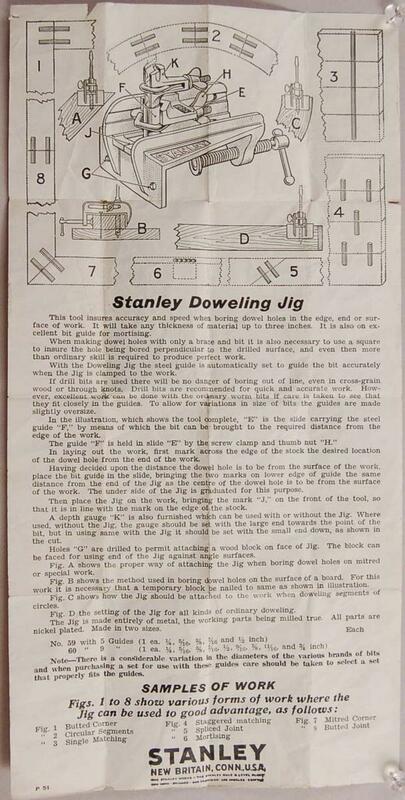 59 Doweling Jig. There are several inherent problems with No. 59's you find nowadays. First, they are usually missing at least one of the drill drill bushing that came with the original jigs. Often they have none at all. Also, the No. 59 was first introduced to be used with brace and bits. Their depth stops were designed accordingly and will not work well with a high speed drill bit. The later version is clunky and was designs so that one stop would work with all the drills. Here again, this idea has its faults. Stanley Tools used to offer replacement bushing for $3.25 each, but they haven't been available for some time. First, I've worked with a couple of metal suppliers in my area and have come up with stainless steel tubing that should be machinable. A small supply of each size is in my shop and about ready to be made into sets. Several costumers will be getting the first of these soon. Pictures of complete sets will be forthcoming. I'll be supplying regular drill stops with these sets, one for each size of drill. These will not be perfect. I will be advising users to tape behind stop to keep it from sliding up the drill. Another trick is to cut a small block measure to set against the chuck as a stop. Another solution that works well is to keep a bunch of washers on hand and space them between the stop and the chuck. I'll also be supplying by No. 59's with a small box. 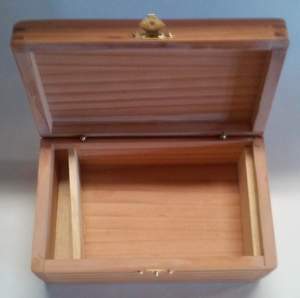 This will be similar to the drill boxes I've been working on. For some time I have been working on a project involving the Stanley No. 59 dowel jig. Its no secret that I love these things. Almost forty years ago I inherited on from my father-in-law. It was amazing how elegantly simple and incredibly accurate this jig was, despite the fact that this particular one has a cracked sliding frame. When I started looking around for a new frame, I learned that there are several variations. Not very much is written about the No. 59, so I decided to do some research. The Stanley No. 59 dowel jig was pretty much built throughout the 20th Century. The jig works by holding a bushing perpendicular over a clamping surface on the underside of the sliding frame. This is done by securing the bushing into a clamping housing. The clamping housing can be slid across the surface of the stock to be drilled then secured to the sliding frame. The entire jig can be slid along the stock and locked into place. There is an index line that accurately shows you when to lock the jig into place. There were a few design changes throughout the years, most of these were superficial. The most significant one appears to have occurred sometime around WWII. Prior to this, the bushing was caught by a hook then pulled back into a 'V' notch in the clamping housing. The newer design uses a screw that drives the bushing into a 'V' notch. Two drill stops were offered during the jig's existence. Remember that this jig came out before electric drills were available. The first stop was actually designed for use with auger bits. The second style could clamp on to any type of bit. They are not very common and tend to throw and electric drill off balance at high speeds. Early on the jig was made from cast iron or mild steel. During the last decade or so this was changed to cast aluminum. The material doesn't seem to effect the quality of the jigs. The only two No. 59's I've ever seen broken was the original one I mentioned and one I abused trying to drill new bushing. For the record, if you happen to be a Stanley collector, I've never seen these come in the old green carton. The earlier ones did come in "pumpkin boxes" with reinforced edges. This has nothing to do with 'users', but makes sense to collectors. The Achilles heel to the system are the drill bushings. Simply they were loose bits that were easy to use. Also, the earlier hook design used a slightly different bushing. It has a notch across the bottom that lines up with a scale on the underside of the sliding frame. No. 59's are easy to find, and without a full set of bushing can be had for $20 or less, Whereas a complete system in good shape can run for as high as $80. Stanley Tools has a website that offers bushing for $3.50 apiece. The problem is that they have been sold out for several years now. Its not likely they ever will be available. Bushing are also available through other sources. These run in the neighborhood of $15 each. My original plan was to step drill stainless steel tubing. This meant coming up with equipment that could be dedicated solely to this product. Stainless steel has to be cut and ground with machinery not contaminated with other metals. In the end, this idea just didn't work out. I just could not get a consistent or accurate result. The break came from a machinist friend. He suggested I look into outsourcing the bushings to a machine shop. They could easily be turned out on annealed drill stock. This seems like the most reasonable solution. Keep your fingers crossed! This seems to be the last hurdle to a problem I've been working on for some time. I'm hoping to offer a couple of things once I get this last problem worked out. The first item(s) will be complete bushing sets and individual bushings. People are asking for them. I also hope to offer complete No. 59 systems. 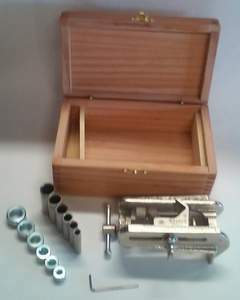 They will come in a box similar to the drill boxes I've been working on. 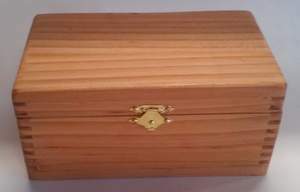 The pictures here are of a box I made for a customer in Texas. The bushings were scrounged up from what I have on hand. There is a drill stop for each bushing. These are commonly available. The problem with the Stanley No. 59 is the shortage of drill bushings. After a great deal of R&D, I've concluded that making or purchasing them just isn't practical or affordable at this time. I will keep working on this problem and will hopefully come up with a source of new bushings someday. In the mean time, there are a few old bushings available. ~You can choose the style of jig, so you will have to contact me directly.